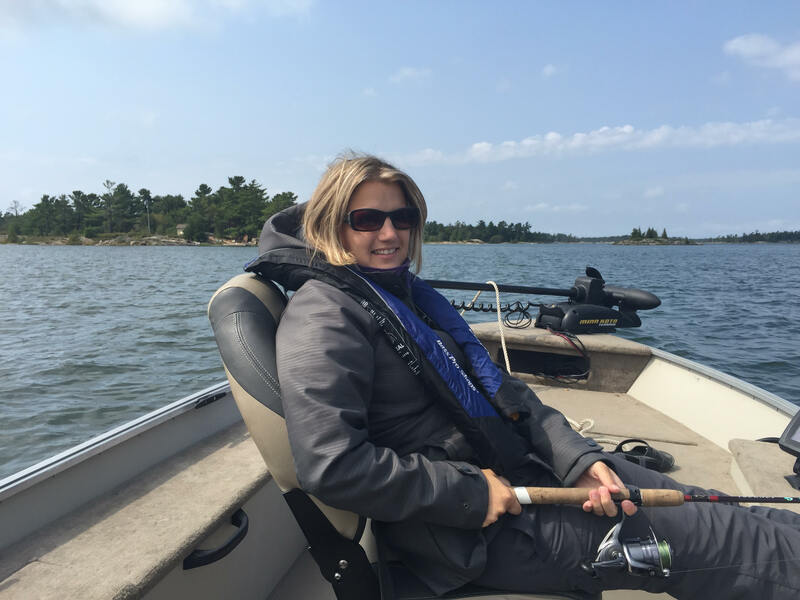 I attended the Hamilton Boat, Fishing and Outdoor Show a few weeks ago to get out of the house with the kids, and to help fuel my excitement for the coming open water fishing season. The kids had a blast, checking out every available boat that they were allowed to explore, along with a good number of camping trailers. I also had a great conversation with an outdoor writer who encouraged me to check out the Orillia Perch Festival. He suggested it was great fun for the kids, so I checked out their Facebook page (link above). The derby is one of the largest in Canada, and runs from April 16th to May 7th. On April 30th there is a special OPP Kids day as well, so it’s a Perch Derby with a lot of other organized elements around it. There are of course early bird prizes, additional draw prizes if you catch and register a fish in good health, but the part I’m most excited about is the opportunity to further engage my kids in the sport of fishing, and the family element of it. Normally I don’t get on the water until may, and I won’t get the kids out fishing until mid to late summer, so this provides all of us a chance for some early angling! With the derby running for multiple days, it also means that if the weather doesn’t cooperate one day, we can always re-schedule. Our hope is to get out twice, one time the first Saturday, and again for OPP Kids Day. If you are looking for some fun, it’s pretty inexpensive, and proceeds appear to go to the Chamber of Commerce. If you have fished it before, please drop me a line and let me know any tips and tricks! This past week I attended the Toronto Boat Show. This is my third year in a row going, and has become a nice event I look forward too. The winter is tough for me, the cold weather, the lack of light, and of course no open water fishing mean I look for events to get me through. I’ll be at the Fishing and Boating Show, the Sportsman Show as well, and have a few other weekend excursions planned to get me through to the Spring. It was two years ago that I purchased my current boat, a Princecraft Resorter DLX BT, and it’s been great. It fits in my garage (a must), is a tiller (my preference), and the 40 hp Mercury allows me to fish, cruise, and even pull the kids on a tube! Eventually, our family will outgrow this boat, but my garage won’t be getting any bigger, so I was intrigued when I came across a new boat from Princecraft, the Amarok DLX BT. This boat is only 6 inches longer that the current one, but is almost a foot wider, and allows for fishing on the stern if you want. It also has more “fishing” features, including storage for 8 rods. It also has some work needed though. It is lacking in storage in my opinion, as the road storage on both sides mean there is no side storage. There is also a flaw in the design where the motor is pretty far back, and you can’t max out the turning radius, even with the model I was in having the Big Tiller. The engineers will get feedback though, and I expect next year the tweaks will be in place. This is the first year for the Amarok and I’m in no hurry to upgrade my boat. There were of course no shortage of boats in every price point (including several million). There was a beauty from Princecraft (in picture), called the Platinum SE that was show for just over 100K :). Everywhere you turned there were amazing boats, but the prices of some were out of this world! I did notice a real trend though to have combo boats, designed for pulling skis, fishing, cruising, you name it. I imaging the idea of the specialty boat is less appealing as people diversify there interests. I went with my buddy Scott, and we enjoyed walking around and not only looking at the boats, but also checking out the accesories such as life jackets, electronics, docking systems, electronics, you name it. There was a vendor for pretty much anything you can image. There was even a three booth spread on 1st Aid Supplies! Finally we decided to head out and grab some dinner and talk about what we saw. We filled out ballots for our chance to win a boat, and of course shook on a “we’ll split it” deal if either of us one. We went on a quiet Thursday night so we had no crowd pressure, and the vendors were getting worn out as the 10 day event was coming to a close, so even the sales pressure was low. If you are thinking of a boat, I really do encourage you to look at the Princecraft line up, and if you are in south western Ontario, be sure to talk to Ryan at Trailerworld industries in Brantford, you won’t be disappointed. And of course, I had to sit in the giant chair on my way out…. Chris with his buff to cover up against the wind. When I purchased these for us a couple years ago, it was the sun I was worried about. My brother Chris and I went up on the Wednesday night and stayed at a local motel so we’d get the most out of our days off, fishing all day Thursday, Friday, Saturday and a part day on Sunday. Thursday morning started with frost on boat, and a forecast of single digit temperatures, and wind for the next 4 days coming from the north and east. The winds would be sustained at 25-30km, gusting to over 40kms. The wind was going to be bad, but the shift coming from the north and east did not bode well. On the bright side, it looked like we’d be dry! We had a great breakfast and then headed out to the launch at Pointe au Baril, at the Bayfield Inlet. We’d be staying again at Bayfield Lodge, where we’ve bee going for over 30 years! We started fishing and fairly early on we caught a nice mid-sized pike. We were excited as we were fearful of a complete shut down in the fishing because of the wind direction, and also because it was a nice fat fish, so we knew the fall / winter feedbags were on! 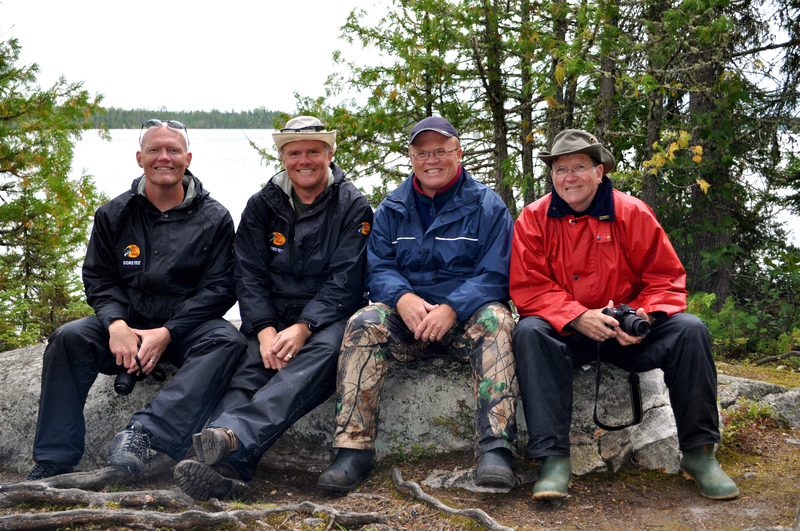 Had we only known how tough the fishing would be the next few days, we would have kept it! The first hour or so of the day was the calmest of the whole weekend. The next video may give you an idea of the conditions we faced, as this video was shot in a calm and protected area. You’d never guess how windy it was from this picture. Shore lunch was extra special, it was a refuge! Before I type too much more, I don’t want to give the wrong impression. This trip was one of the best we’ve had in years, as far as fun and relaxation, and camaraderie. The stories you tell though are the most memorable and make the best stories, but may not reflect the whole trip. One of our goals was to have a lot of shore lunches. We were worried the wind would make it impossible to manage the fire, but we had a few “go to” spots, and had one in mind that we could relocate the fire pit to a secluded area. The potatoes and beans cook, next up is the fish! We pulled up the boat, built up the fire ring and used my shore lunch box as an additional wind break. 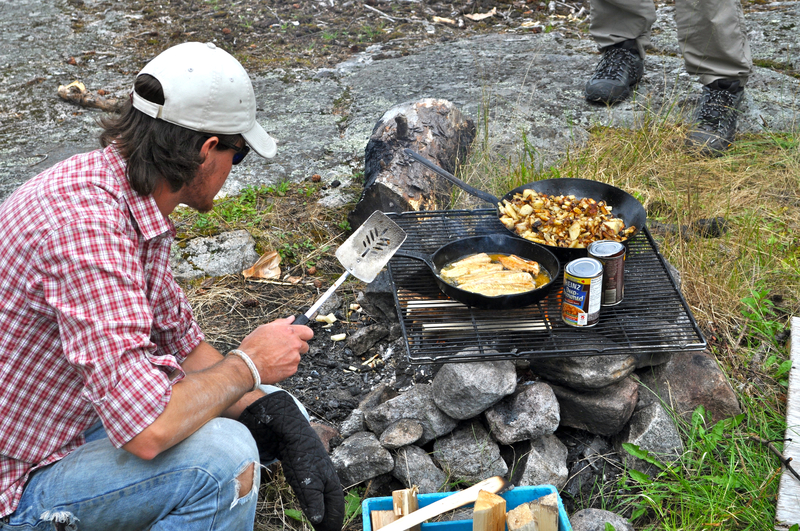 We used the flint to start the fire and then went to work prepping the potatoes, the fish, and the beans. I’ve always felt the shore lunch is perhaps the high point of any fishing trip, and this time around we had 3 amazing lunches in a row! 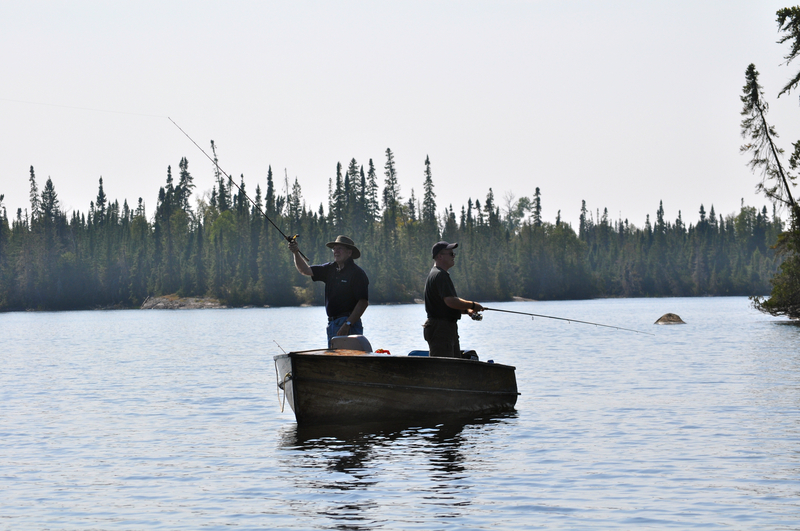 This one was just Chris and I, enjoying some nice walleye we caught earlier this year at Brace Lake. Great shot of Mark enjoying the sunset after a day on the water. We kept at it the rest of the day, but then called it a bit early, with the chill setting in, low light at that time of the year, and low fish totals we decided to get ready for the following day. Friday started off with sun, and wind, and the rest of the group coming to join us. My father and eldest brother Mark were going to be up in time for lunch (second shore lunch!) and the rest of the team would join by dinner. We had a great day on the water, with each of us catching a few fish, enjoying some good laughs. This fish isn’t much bigger than the lure he hit! Our third day was as windy as the rest, with the wind coming out of the east, not exactly an upgrade! With the full group on the water for day three, we were optimistic of some fish, and it didn’t take long for Ed to land a series of fish that none of us could match! The highlight for the trip was our group shore lunch. We had a combination of fish from earlier trips, and a few eater Pike we managed to secure the previous days. For those of you who have been on a shore lunch, you’ll appreciate this following video, for those of you who have not, use it to justify adding it to your bucket list! 38inch Northern Pike, a person best for Dad! It’s always great to be there when someone catches their first fish, or their biggest. I was fishing the Sunday morning with my Dad, and had the pleasure of netting his personal best Northern Pike. After days of few and small fish, it didn’t take long to realize this was a big fish. It was 38 inches long, and while the shot doesn’t show it off, it was a fatty :). The cold hands and the wind burned faces were quickly forgotten when we landed and released this brute. After lunch that day I was out for the last run with my brother Chris, and not more than 100 feet from where Dad caught his, my lure bounced off a shoal and was smoked by this fine Northern. While not as large as Dads, I’ve always believed that any Northern Pike more than 30 inches is a quality fish, and when caught in the late fall, it’s got that extra weight. Everyone caught a few fish that last day as the weather finally started to cooperate and the winds shifted and began to calm. We pulled out the boats, packed up and headed home. There were a few more great stories, like the one where Chris and Ed got snagged, then the motor cut, and the wind bashed them on the shore while a cottager watched, but that’s for another day. One final video shows the aftermath of a truly funny scene (at least from our vantage point). We were trolling close to my Dad and Brian when we saw Brian putting up a huge fight against what we assumed was a massive fish. Only, after some time we realized that while pretty big, it wasn’t a fish. Enjoy the video and thanks for reading. 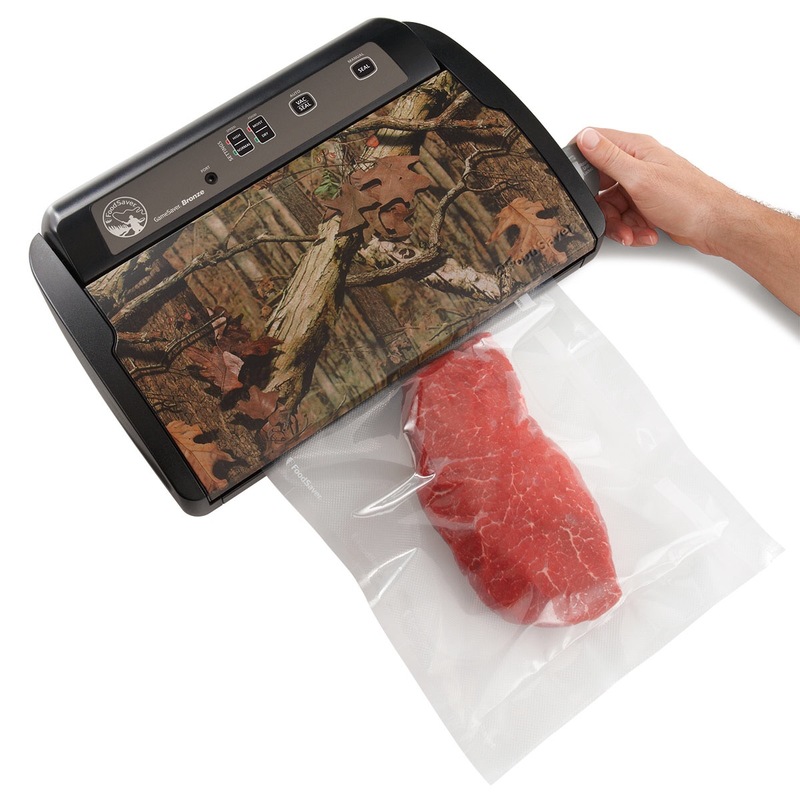 At Long Last, A Food Saver! First off, I hope you all had a fabulous Christmas. We’ve just put e kids to bed and are reflecting on an amazing family day. There were plenty of gifts exchanged, but I’m very excited about my new Food Saver Game Saver Bronze! I’ve been in the market for a Food Saver for a while, and Santa did not disappoint. I have three main reasons for wanting one of these. First is that when I go on fishing trips I make a financial investment in the entire trip, and when you can only bring out your legal limit of fish, I want to be sure that my catch is kept fresh, and that it will remain so until time to cook it. Second is for when I go camping etc, where I’m storing mixed foods in the cooler. I can’t stand it when, as things begin to thaw, you find things leaching out of freezer bags, and you have contamination. Finally, I like buying things on sale, and in bulk, and this will ensure that when I capitalize on a great deal, I don’t end up throwing the food out because of freezer burn! Below is a video of me putting it to work. Apologies for referencing the wrong model number, but enjoy. 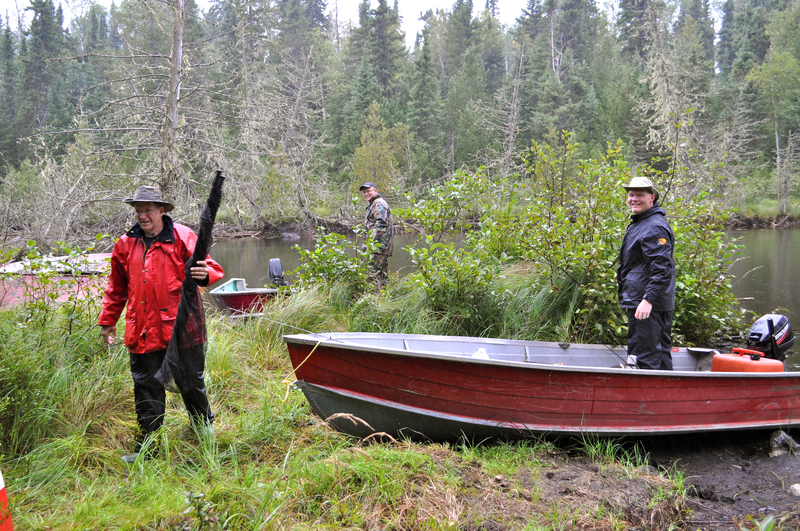 My annual weekend fishing trip, known as “the couples trip” was this past weekend and was once again a success. 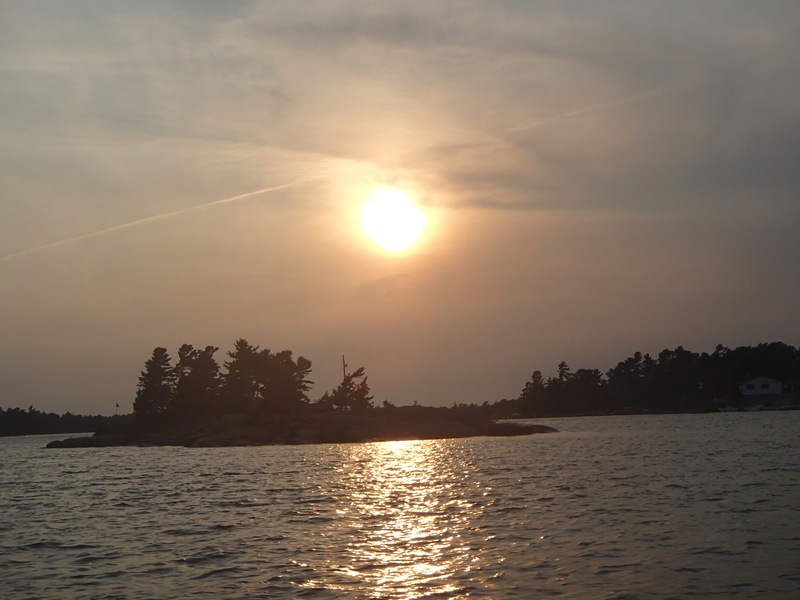 Each summer my father (Dave) and his wife (Betty), my brother (Chris) and his wife (Lisa), and of course Carolyn and I head to the Bayfield Inlet just passed Pointe au Baril for some Pike / Bass fishing. Part of what makes this trip so fun is that the focus isn’t on intense fishing, but more on enjoying each others company in a beautiful area, enjoying nature and hopefully catching a fish or two! Carolyn and I made it up just before noon on the Friday. It was overcast but there was no threat of rain. We put the boat in the water, cleared the marina where the water was a bit lower and where there was no boat traffic, and cast our first lines. 30 seconds later I had the first small mouth bass in the boat! We boated about 1/2 dozen fish (bass and northern pike) in about 90 minutes before heading in for some lunch. We got right back at it and boated just as many fish in the afternoon, what a great day of fishing. Great weather to fish in, and constant activity. That afternoon / evening the rest of the group joined in, and we headed out for an evening fish. We had a spectacular sunset and managed to land a few more fish before heading in for a late dinner, some cards and fellowship. The next day we awoke to much colder weather, and light rain. The fishing in the morning was pretty good, but by afternoon it had shut right down. We all put in a lot of time on the water, particularly after the rain moved on, but that cold front and change in weather just turned the action off like a switch. 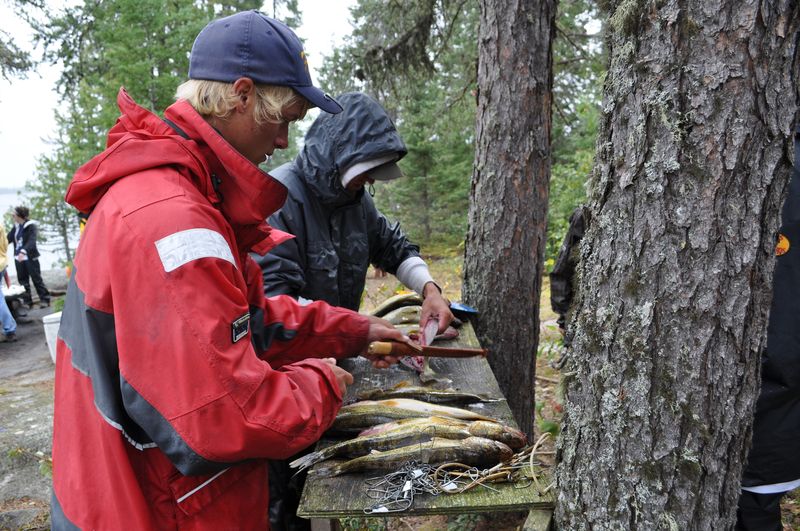 We did enjoy a nice fish lunch including some fresh caught pike, and off course some cards and a game of “fishinopoly”. The final day we saw different weather again, this time high sun and super hot. What a difference! We managed to boat a few fish, but nothing like the quantities of a couple days earlier, and nothing like the sizes the year before (a 37 and 34 inch pike were caught). We did though take advantage of the weather for our favourite part of any trip, the shore lunch. Fish, potatoes, beans, warm garlic bread and your drink of choice, what could be better? My trips for the year are not done, I have may annual guys weekend the first week of October, and a final weekend up in Haliburton towards the end of that month. Stay tuned! 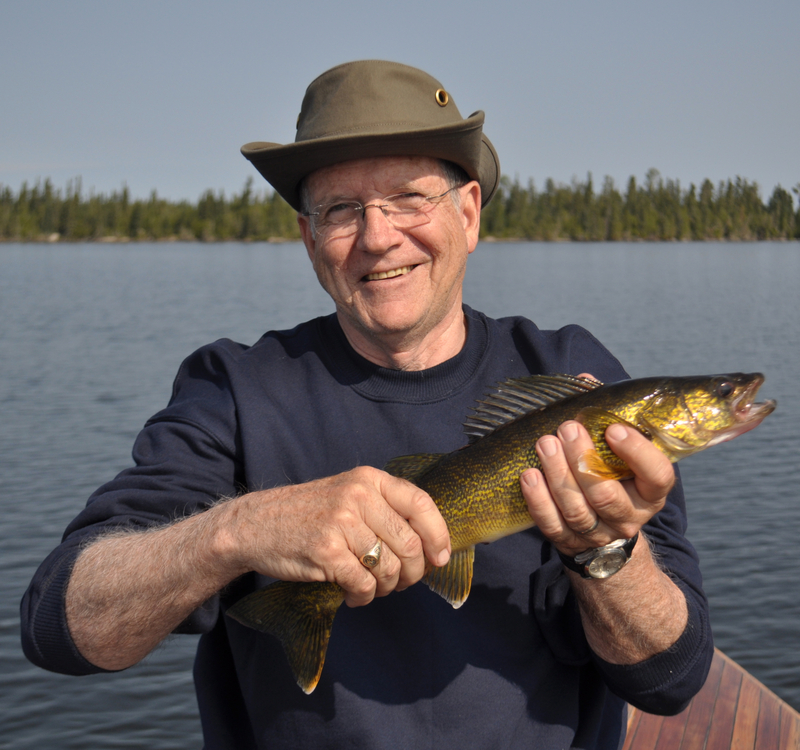 Writing this post is long overdue, but also a wonderful walk down memory lane to the most impactful fishing adventure I’ve been on to date: my very first fly in fishing trip to celebrate my fathers 70th birthday. Dad had been taking his sons on an annual fishing trip for over 3 decades, so we knew how special these trips were, and how doing a fly in with his sons would be an incredible opportunity. Planning a trip like this one was a bit of a challenge, as our previous trips had all been to places we could easily drive to for a weekend. However, I soon learned that things would fall into place. The first challenge was to find out where we’d go! A few final details before we fly in. 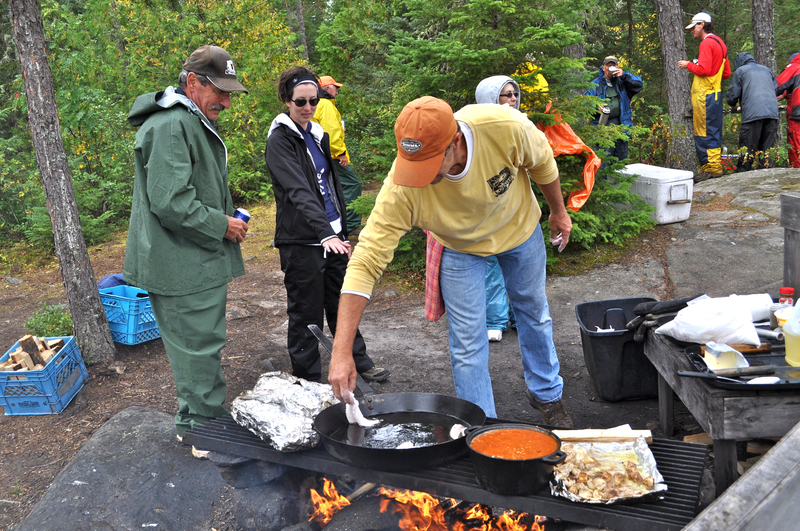 There are limitless options for fishing camps in Ontario, and all we really knew was that it had to be a great outfitter, we wanted American Plan (meals provided) as this was to be a real special holiday, and we wanted it to have full amenities so my father wouldn’t be showing in the lake. I can remember vividly the day that I was at a charity BBQ flipping burgers when I was discussing the trip with a buddy from the office. I explained that I didn’t know where to start to find a great lodge. He looked at me and said the new memorable words “my college roommate owns and operates a great fly in lodge, I’ll give you his contact information…”. And thus I was connected with Esnagami Wildness Lodge, and owner Eric Lund. Owner / Operator Eric Lund at the group shore lunch. I remember my first phone call with Sue Lund, it was during the off season so they were in their winter home and she was as enthusiastic to receive the call as I was to make it. It would be the first of many phone calls and emails that I would need as an organizer, and both Sue and Eric were patient, thorough and professional in their dealings. We were able to secure a date and now only had to overcome over a year of anticipation and waiting for the big trip. 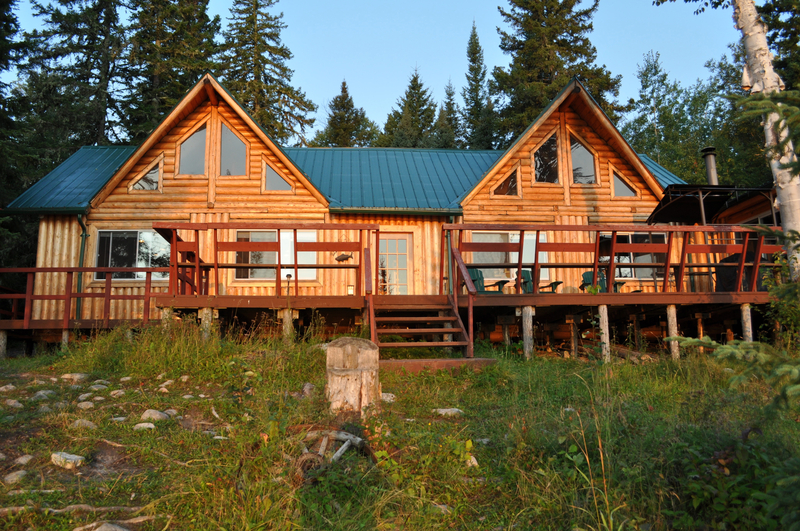 Now, Esnagami Wilderness Lodge is not really any more expensive than other top quality lodges, but it was more than we were used to paying for our more “local” trips, plus we wanted to treat Dad, so we planned over a year in advance to save up enough money so that it wouldn’t be a burden to any one person. Our group, resting after being well fed. The extra time allowed us to make use of Christmas and Birthdays to improve our rain gear, fishing rod and reals, and of course tackle. We would be meeting in Haliburton Ontario where my Dad lives, and then making the drive to Nakina, Ontario to Cordingly lake where the float planes leave from. We would need to arrive the night before in order to make the long drive and be ready for an 8:00am flight. Our drive was full of excitement and anticipation, we were like school boys. We had everything planned out, breakfast in Huntsville, lunch in Cochrane, and then the final stretch drive to Nakina for dinner at the Nakina Train Station. Sadly, this restaurant is no longer in operation. 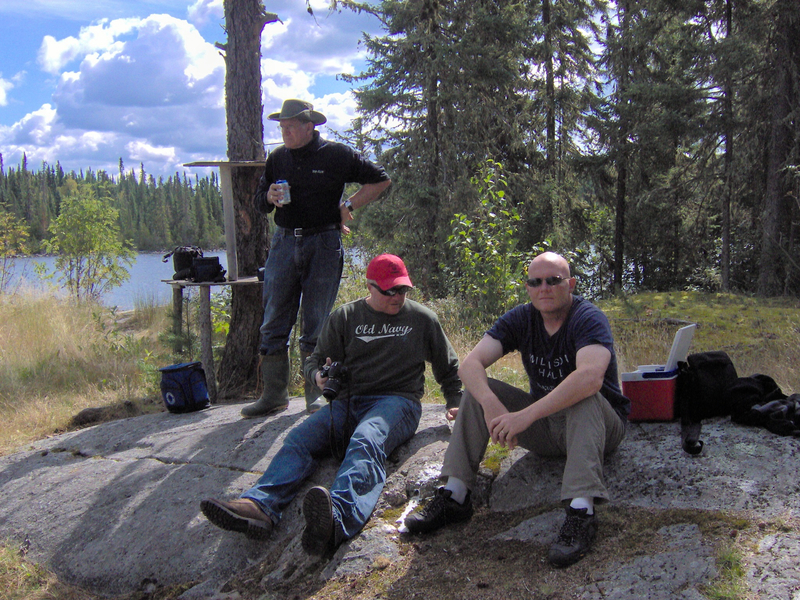 Our dinner there consisted of great food, and the company of other anglers who were flying to various lodges the following day also through Nakina Air. The main lodge is nothing short of spectacular. Our accommodations for the night before the trip was actually a cabin right at the air base. It was great to have the space to stretch out, play some cards and do one last gear check. What we were not expecting was the note on the door when we arrived that asked us to be ready at the dock at 5:30 for a 6:00am flight (30 minutes to unload, weigh gear and load the plane). The trick was that we were counting on breakfast in Nakina, but would not have the chance now as nothing would be open. This concern would turn out to be unwarranted, as things worked themselves out :). Sitting back and relaxing as the guide prepares lunch. We arrived at the dock and watched an efficient operation take over. We were mesmerized by the speed and efficiency with which our gear was weighed and loaded onto the float plane. My Dad got to ride up front with the pilot, an extra special treat. If there was any part of the trip that was dissapointing, it was the flight. I think we had stoked up the “fly in fishing” part of the trip so much that we never considered how long the flight actually was. It was less than 10 minutes! Before we even had a good look around we were circling in and could see the buildings of Esnagami Wildnerness Lodge before us. 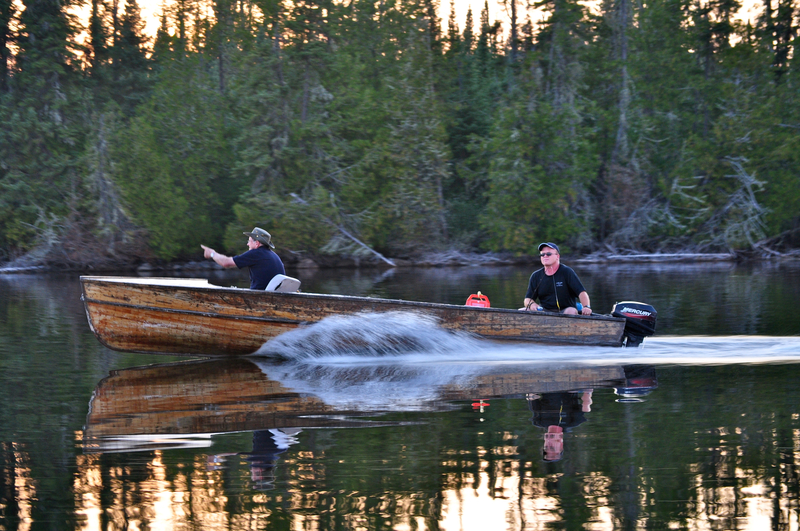 The cedar strip boats are both great to look at and to fish from. I was and continue to be amazed on how a pilot can put a float plane up to a dock better than most anglers can do with a boat, but it happens each time. We were tied off at the dock and warmly greeted by owners Eric and Sue. This was a nice touch, and the first of many that week. After introductions Eric explained that our gear was already being taken up to our cabin and would be waiting for us. He then pointed out that because of the early flight we must have missed breakfast, so they had set an extra table for us, and come on up for a hot breakfast. That breakfast was the first of many great meals at the lodge. Each breakfast was made to order, so if you wanted eggs, and pancakes, with hash browns and bacon,you just had to ask. Each day I had something a little different just because I could, although I found myself ordering the fresh blueberry pancakes often. That first breakfast also afforded us It our first view of the amazing main lodge, full log construction with loft and qualify wood furniture, as rustic as you could hope for, but at the same time immaculate. Attached was also a common area where you could hang out if the weather was rough, watch some TV or play a board game, and it had a small tuck shop as well. A beautiful ride to the next hot spot. 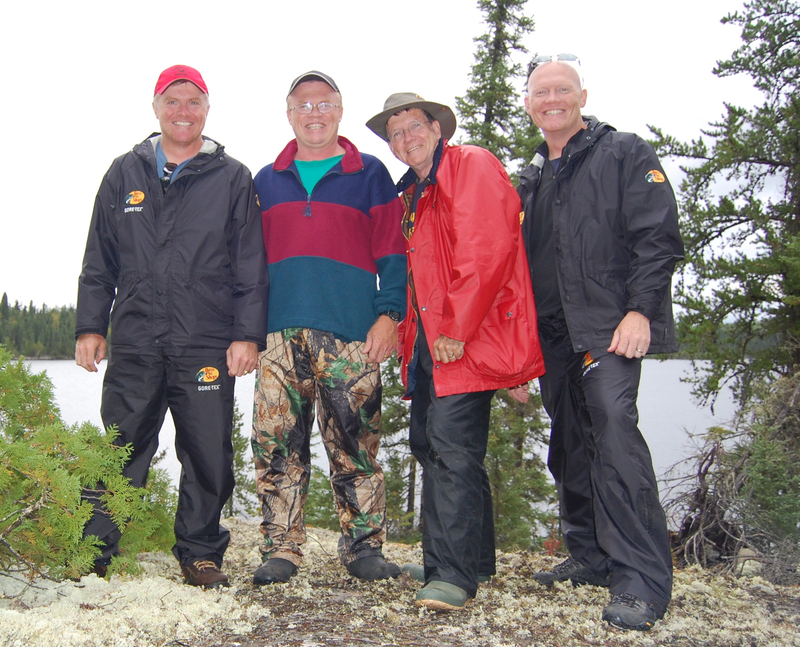 It was also where Eric met with each group to review a map of the lake with marked hot spots. What was interesting about the map was that he updated it as the summer progressed, so it identified the best spots that were currently working for Pike and Walleye, but also where they were the previous months so you could see the fish pattern progress. After getting our fill we headed to our cabin, and what a treat that was. We were on American Plan but our cabin had a full kitchen, with living / eating area, three bedrooms and a bathroom with shower. There were electric lights during the day until 11:00pm, with propane lights if you were up later. There was also a wood stove for heat and a nice sized deck to relax on. We rigged up our rods, changed into our fishing clothes and headed down to the docks to see the boats, but to also meet the guide that we had hired for the day as a bonus for Dad, and hopefully some assurance for us of a good start to the day. The boats were 18ft cedar strips with 20hp mercuries. 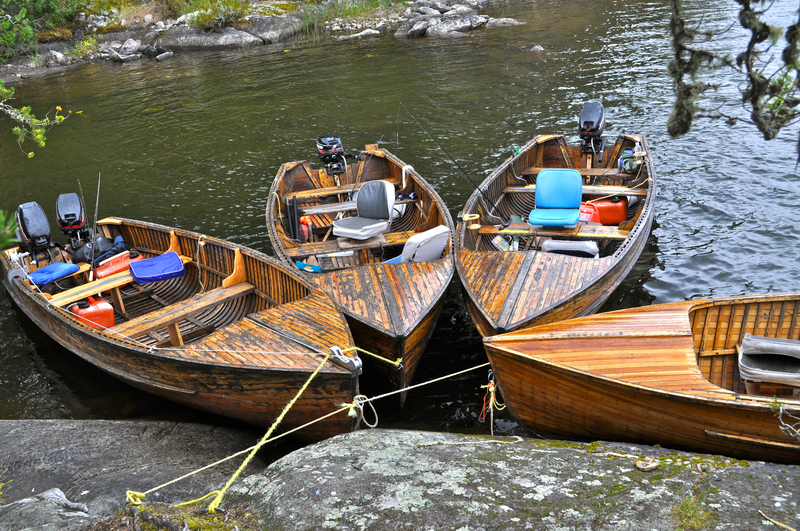 If you have not had the chance to fish from one of these boat you should try to find a way to make that happen. Spacious, stable and beautiful, a real treat to fish from. We were fortunate that our guide for the day, Mark, was also the head guide meaning he had many years experience working the lake. He met each of us and did a great job of asking just the right questions to learn what our goals were, and also what our experience level was. He grabbed some minnows for jigging, took a look at our rods and reels to see what we were working with, and then loaded the shore lunch kit into the boat and we were off to the first spot to jig for some walleye for lunch. A short boat ride later we pulled up to a spot that Mark said was working well the day before. We all fished it for about 7-10 minutes with no action when Mark asked us to reel in. We looked at him with surprise as we were used to fishing spots for a long time, even if we did not catch anything. He simply said the bite was not on in this location, let’s move on, and we did. It was an important learning opportunity for us to use in the future, to work an area or technique long enough to know if it will be effective, but also knowing when it was time to move on. 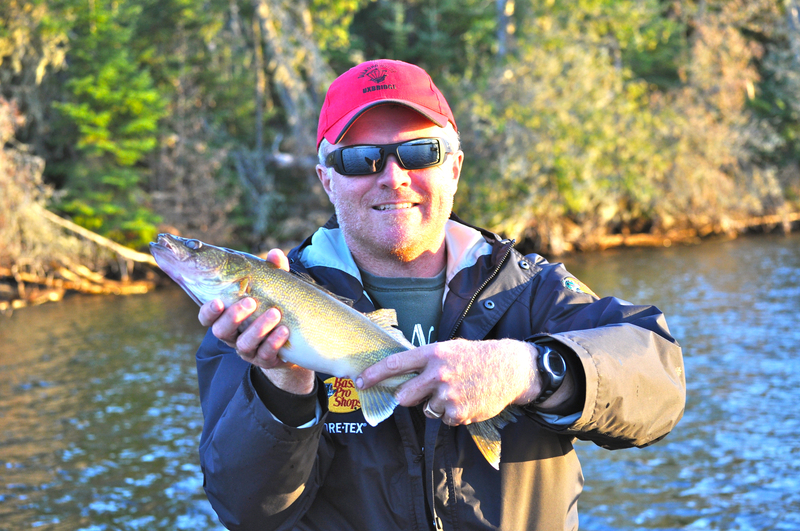 Our second spot had a Walleye on my line on the first drop, and it was quickly on the stringer. Seeing that beautiful dark green with the gold belley is so satisfying. Mark also dropped a marker bouy over so we knew exactly where we wanted to stay close. We had a great morning jigging up walleye and just enjoying our time together on the lake. At each location Mark was sure to make sure we saw on the map where we were. 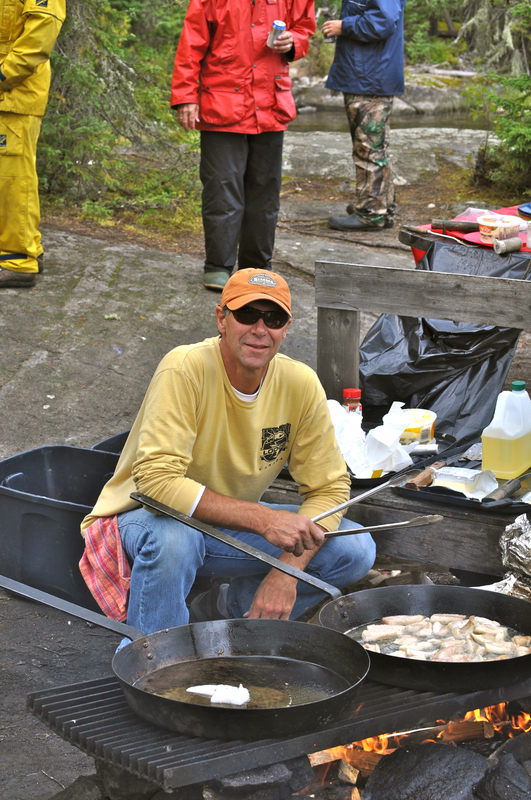 We pulled up on the shore for our lunch destination and again watched experience and efficiency as Mark started the fire, cleaned the fish, cut potatoes and onions opened beans and in about 40 minutes had us eating a meal all should experience, a shore lunch cooked over an open fire, on a remote Canadian Lake. Trophy shirts for all, well not quite. 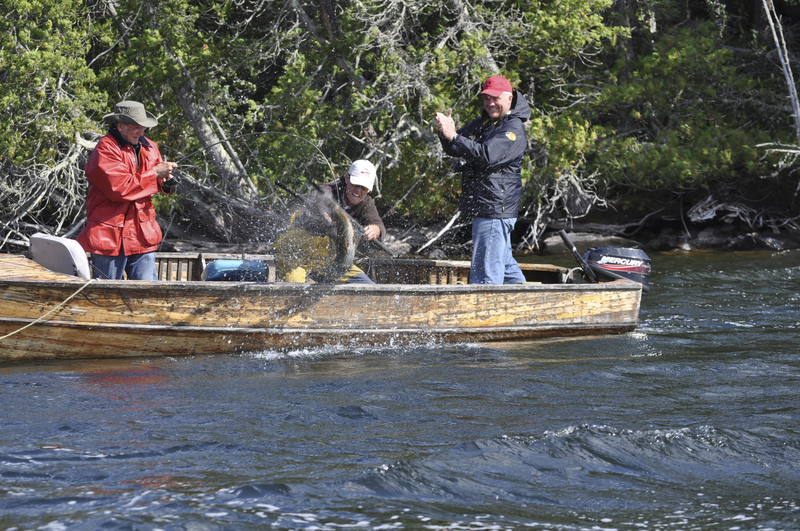 One thing that I should note is that the lodge has a fun contest that they use to also promote catch and release. 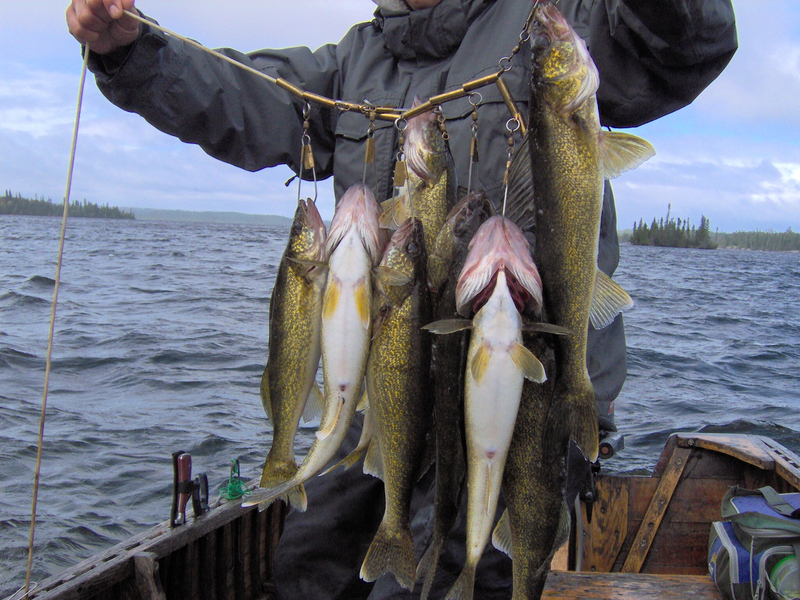 All Pike 30 inches or larger, and all Walleye 24 inches and larger are to be returned to the lake. These are considered trophies for entry into their contest for a free trip back to the lodge. 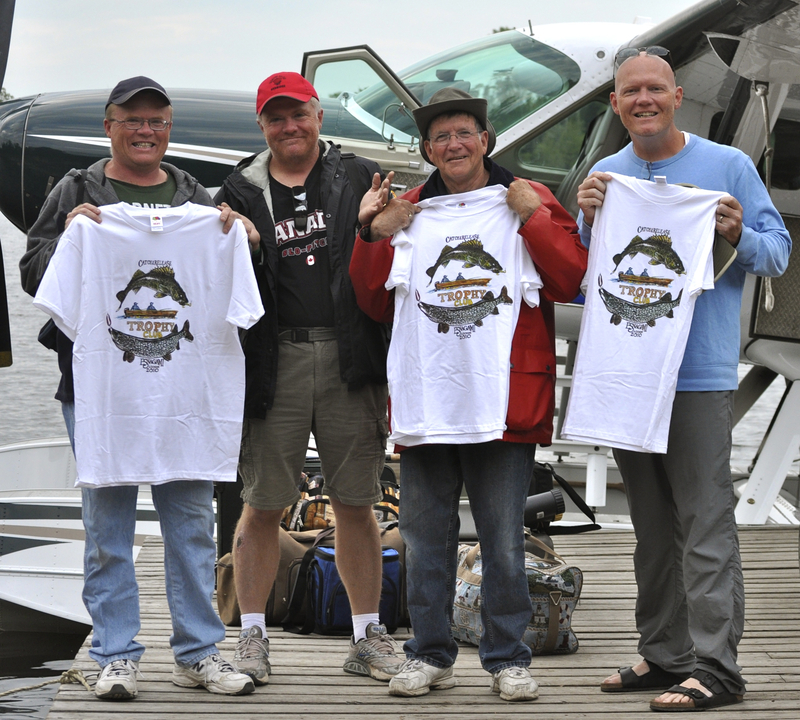 They give away two from all of the entries, as well as a trip for each person who caught the largest Pike and Walleye. Your entry also gets you a free trophy fishing shirt for bragging rights. That afternoon we decided to focus on Pike locations so we had some balance to our fishing options. Early in the afternoon my brother Chris lost a large fish at the boat, much to the dismay of the guide. I was able to land a 30.5 in Pike, which while not huge, did get me a shirt and an entry into the contest. Our trip was in the middle of August, where I find it to be some of the toughest fishing when it’s super hot and there is lots of deep water for fish to tuck into. We wrapped up our day having all caught fish, and headed to the first of many amazing home-cooked and plate-served meals. 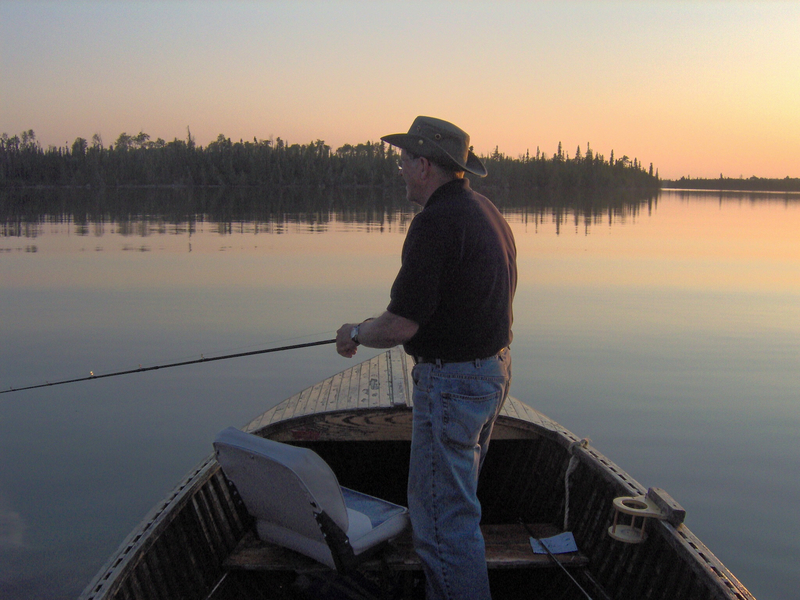 That evening, like most, we also went out for some evening fishing at some of the closer locations. Getting ready at the portage lake. The second day was the most challenging for us. While we had a map and had just spent a day with a guide, it seemed like when we were on our own we had all lost memory of exactly where each spot was, and which island was which. Esnagami Lake has 120 miles of shore line, that’s a lot of lake! After an OK day of fishing we returned to the lodge where I arranged for some additional guide service for later in the week. There are a few side trips you could book, one was river Walleye trip, but the river that year was too low to use. There were also two portage lakes available, you just had to sign up. So the third day we headed to Spotted Lake. We chose this because the lake allowed for 4 people in 2 aluminum boats, and also because it was going to be a very windy day, so getting onto a smaller lake seemed wise. We followed the map to the portage destination and pulled our boats on shore. We made a short hike to 2 waiting boats on the other side, with gas ready. In a short amount of time we were off fishing. Eric and provided us with a map of this lake as well, and had made recommendations for fishing locations, technique and lunch spot :). We had a great day fishing, using casting, trolling and jigging to great effect. We caught several blue Walleye which was a treat. At one point during the day my Dad and I were casting a tiny narrow bay. I had caught about 8 Pike on 9 casts at the shore, while my Dad was casting back at the opening to the bay. He told me he was snagged, so I fired up the motor and started slowly back trolling towards his line. I was watching intently so I didn’t run the motor on a rock or log as I approached his line. I then stopped and stared in disbelief before shouting, “That’s not a log, that’s a huge fish!” Dad started to reel and as if the fish sensed it, it fired off and snapped his line like it was nothing. While it’s never a good story when the fish got away, to have seen this monster Pike was just as exciting and it renewed our efforts the rest of the day. Our lunch that day were sandwiches, fruit and home-made cookies. Each evening at dinner the staff would ask you what your plans for lunch were the following day. If it was shore lunch, they’d have a kit ready with everything you would need shy of the fish. If you were doing boxed lunch they would take your order and there would be a cooler that morning with your name on it and your pre-ordered lunch inside. 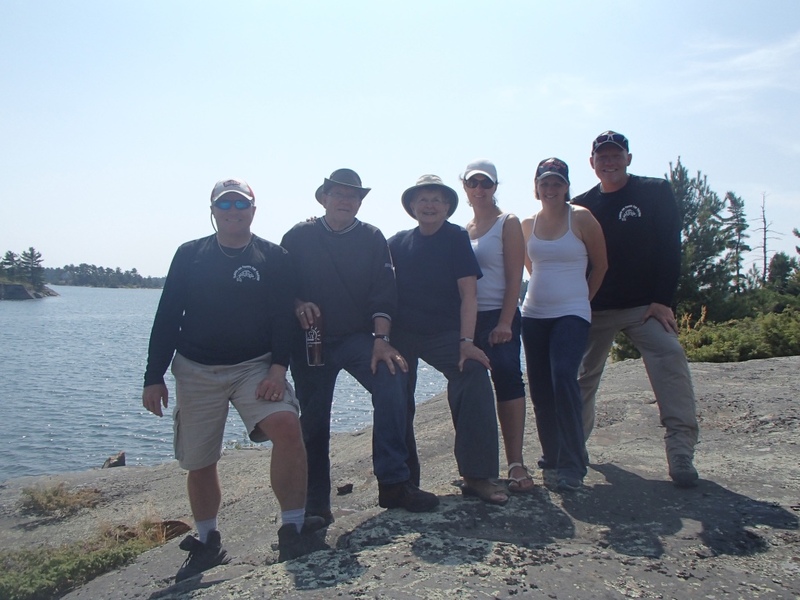 A group shot in one of the portage lakes. Our fourth day we had booked time on another portage lake, Betty Lake. It was also a smaller lake, in fact this one only had 1 boat available, so we decided that two of us would use it in the morning, then we’d meet for lunch and switch. 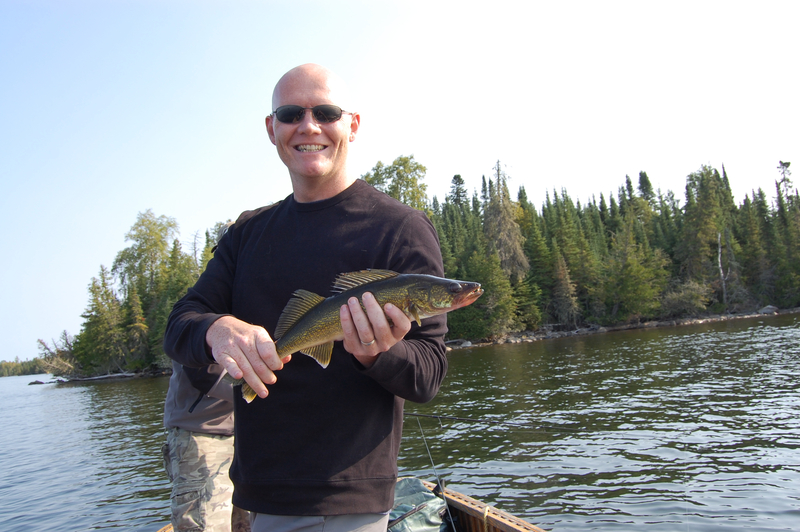 The fishing was great with lots of medium sized Pike who were ferocious with their hits. The funny part of this story (depending on your perspective) came when Dad was taking a lure out of a Pike. It was a bit of a job so he set his rod down to two hand it, and released the fish. He then reached for his rod which was nowhere in sight. He had forgotten he was no longer in the 18 ft boats and had actually dropped his brand new rod and reel over board. He was a bit sour the rest of the day. To cap off the day for Dad, later this same night we were out for our evening fish when he hooked into a huge Walleye while jigging. He was fishing with my older brother, who reached down and grabbed Dad’s line to crane the fish in the boat. From our perspective a few metres away, we knew this was a huge fish and just as we shouted to use a net… snap went the line and another massive fish got away. Dad consoled himself with a cold drink or two. Our fifth day had two features we were excited for. One was that we were back with a guide, and the second was that it was group shore lunch day. Once a week all of the guest who want to join at a predetermined location for a huge meal. This day was a Walleye day for us. Overcast skies with just that bit of wind to create a chop, we were set for some hot Walleye action. Our guide for the day also told us our two boats were tasked with catching enough fish for the whole group, and he hoped we were up for it, and so did we. That morning we fished shoals, sand bars, shore lines with wind, all the traditional spots. We used 1/4 oz jigs with platic grubs, mostly tipped with a live minnow. Our boats successfully provided for the group. We caught a lot of fish. Once we had enough fish we just kept going and releasing all we caught until it was time to head for lunch. We met at the prescribed location and I was again treated to an example of efficiency when two guides cleaned enough fish for 20 people in about 10 minutes, not wasting an ounce of meat. It is really impressive to see an experienced angler clean fish. 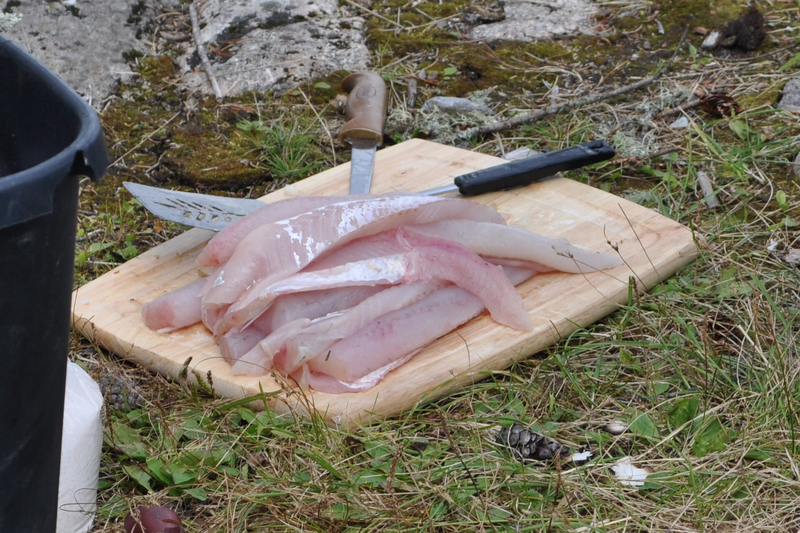 Our lunch for the day included fresh walleye and pike, beans, fresh made onion rings, warm bread, and a Walleye chowder. Drinks were provided for all and we had a great time chatting with all of the other guests. It was a great experience to be connecting with people from all different geographic locations, brought together in one place by our common interest in fishing. All are gathered for the feast. That afternoon we headed back on the walleye hunt, at one point getting into a school where each fish was more than 20 inches but just less than 24 inches, a great problem to have. Our trip had one day left, and while we had all caught a pile of fish, we were still missing one thing, and that was to get a big fish for my Dad to cap of his special trip. Our last day found us with our 3rd guide for the week, and we made it clear to him that our goal was to get a big Pike for Dad, so we asked him to take us to high percentage areas. 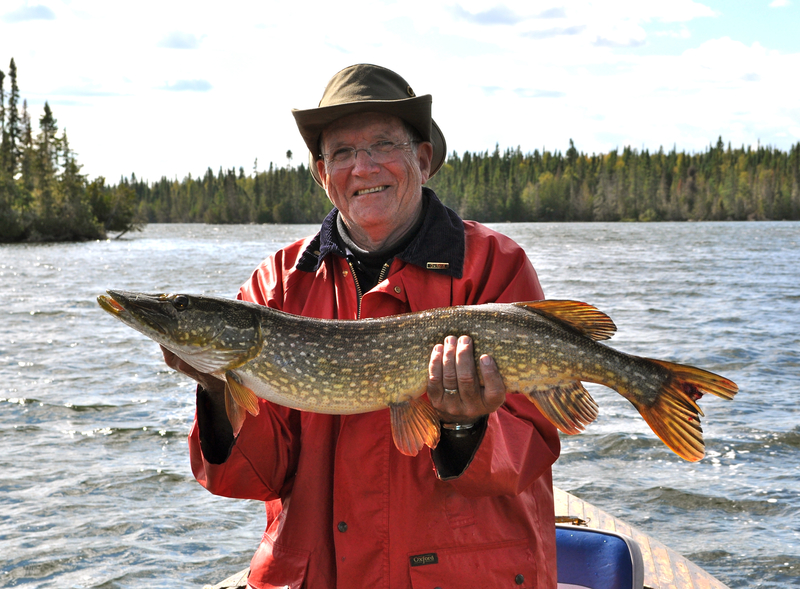 Our morning saw us in various Pike spots, and while we caught lots, we were not getting the big ones, mostly mid 20s. Just before lunch we were at a spot called Betty Falls, which is the outflow from Betty Lake (where Dad lost his rod). We were enjoying the scenery and casting some great Pike water when I looked over to see activity in the other boat. My Dad’s rod was bent, the guide was getting a cradle net ready, and my brother was reeling in to get his line out of the water. It was a unique perspective to see it from another boat, and I grabbed my camera with zoom lens and started shooting. I took two of my all time favorite shots. One was of my Dad proudly displaying his 35 inch Pike (which until recently was his largest pike ever), and the other was a shot of the guide with the fish in the net, my Dads rod still bent, and my brother clapping his hands in support. That picture captured the moment perfectly. Here is my all time favorite fishing shot. We spent the rest of the afternoon trying to add to our trophy Pike total, already beginning to talk about the long drive home facing us tomorrow. We decided to pass on the evening fish and spend time just chatting with each other and the rest of the guests down at the main lodge. 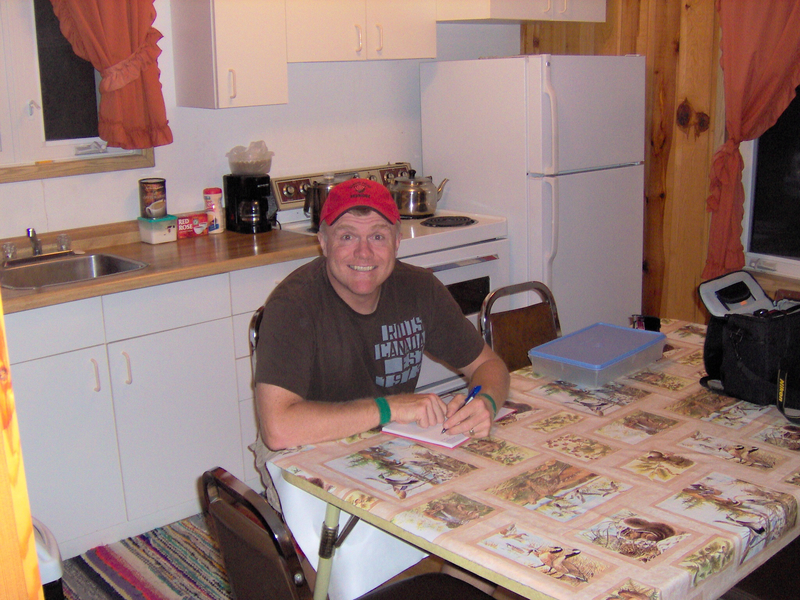 Being on the American plan you have extra time when you don’t have to cook or clean up, and in fact each day staff came in a tidied our cabin, including making our beds and washing any dishes we did happen to use (again, a real nice touch). First thing the next morning our gear had been brought down to the dock where Eric and Sue again met us in person to thank us for choosing Esnagami Wilderness Lodge, and to wish us well. Our final shore lunch is prepared. 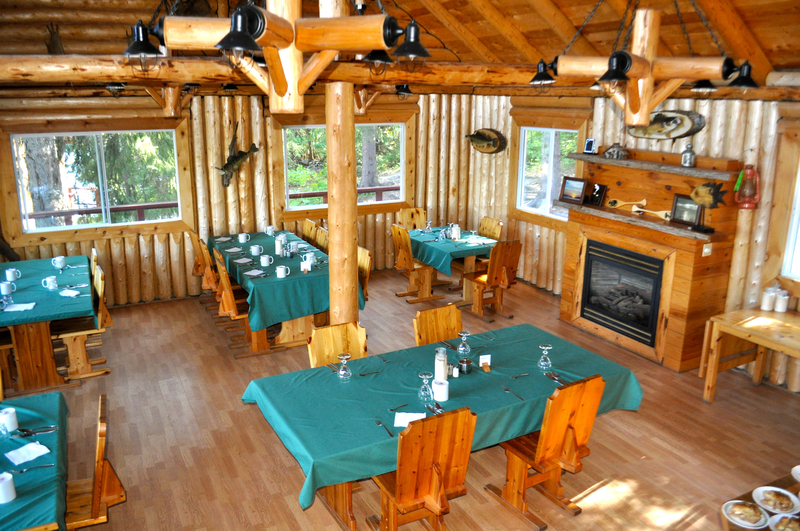 I haven’t been back (yet), but it still ranks as my favourite fly in fishing trip for that perfect combination of a great lodge, great fishing, and great memories of fishing with family. I’ve since been to several different lodges/outfitters, but I’ll always remember Esnagami Wilderness Lodge as my first, and I know I’ll be back again.